The lecture that had swallowed me is done and so I can tackle some backlog. In order to make some ground I’m going to reluctantly skip over two Oxford papers I went to about which, for one reason or another, I just don’t have anything useful to say,1 and skip straight on to Tom Faulkner presenting at the Institute of Historical Research Earlier Middle Ages Seminar on 26th January 2011, with the title “Peoples and Legal Practice in the Carolingian Minor Law-Codes”. Now, I dithered about skipping this one too, not because it wasn’t fascinating, but because again Magistra et Mater has got in ahead of me and covered it excellently already. But there remain a point or two that it’s still worth drawing out. You may want to read her post first, though, because she’s done a better job of explaining what the paper was actually about than I’m going to have time to do. In 802 a couple of Carolingian sources record that Charlemagne had all the ‘laws of the nations’ in his empire written down and thus fixed.2 And we have a number of texts of such laws, the most obvious one being the Law of the Salian Franks or Salic Law, but also the Laws of the Burgundians, Laws of the Lombards, Laws of the Bavarians, and so on (and of course the Law of the Goths, which is different, not least because it’s actually called the Forum of the Judges—that is, it’s not ethnic in its presentation).3 Some of these things had been out there for a long time but that endeavour of 802 probably has a lot to do with the state of the current texts, Goths aside, not least because recent work by such as Christina Pössel is emphasising how new some of the apparently ‘ancient’ practices in the Salic Law might have been. But if so, there are some weirdnesses to tackle. There had been no independent Burgundian kingdom for nearly three hundred years by this time. Who called themselves a Burgundian any more and on what could that claim rest? And similar problems arise for texts Tom was talking about, not least the Ripuarian Franks, a group who appear in basically no sources other than this law. Ripuaria as an area does occasionally get mentioned, but it’s a pagus, not a regnum, a district not a kingdom. Tom argued that really, it might be little more than the territory of the see of Cologne. But this lawcode of a basically illusory people is one of the more copied ones of the group, perhaps just because it had useful stuff which could be raided for means with which to make decisions in the very (very!) few cases where we have reasons to suppose such lawcodes were actually used, rather than just stored up as tokens of nationality. Such dilemmas get even more pronged when dealing with a text called the Ewa ad Amorem. This is a very different sort of law text, though it has been associated with this big endeavour: Tom laid it out for us and it seems pretty clearly like a set of rules being agreed in a community for how they’re going to handle various affairs, like land sales and thefts. It seems to relate to a little place in Frisia called Amor, and it is extensively referential to other codes (which is nice, because, as Tom had pointed out, Lex ribuaria actually quotes modified Salic law quite a lot too) and peoples, so that you get frankly unhelpful statements like: “… about ecclesiastical affairs and about the servants of God who serve there, we have the same, as the Franks have.” Which Franks? Salic, Ribuarian or real? And so on. Although Levi Roach found parallels in Anglo-Saxon laws (some of which are actually usually called treaties) and someone else in Venetian treaties with foreign powers, the whole thing put me in mind of nothing so much as Spanish fueros, which were civil law codes constructed for new towns in the frontier zones, by the locals in agreement with the king. The counts of Catalonia do the same sort of thing sometimes, too. A central authority and its rights are recognised, but the actual day-to-day stuff is left local, and the implication there is that that’s because they’re rather on their own and central help and involvement will be hard to come by. In that last respect, though, Ewa ad Amorem is different; it’s clear from a reading that this code has become necessary precisely because king’s officers, counts and so on have been in the area a lot and there are problems making this mesh with the local way of doing things, not least because until this was written probably there was limited agreement on what that way was. So, though Tom didn’t really make much of this point, this little code is more interesting to me than the big ones because it seems to have the same sort of ad hoc necessity as some of the capitularies, and may show us how being on the more-or-less-willingly receiving end of Carolingian administrative reform worked out in practice. 1. Mark Williams, “Stormy Weather: divine women and the figure of sin in Aided Muirchertaig meic Erca“, Oxford Celtic Seminar, 20th January 2011, was as engaging and entertaining as Mark always is, where I’ve seen: he tells good stories about good stories. But aside from the fact that it is a good story, I really wouldn’t know what to say about the paper: it was all new to me. I probably can’t spell most of it, even. And Richard Allen, “Life before Lanfranc: the careers of three archbishops of Rouen, 942-1054/5”, Oxford Medieval History Seminar, 24th January 2011, was an expansion of the earlier paper of Richard’s I reported on last year and I don’t think I can think of anything extra to say this time round. 2. Specifically Einhard’s Vita Karoli and the Annals of Lorsch, the former of which is edited in the MGH and thus online here and more accessibly to the Anglolexic, at the cost of some appreciation of how cunning his Latin is I am told, and more on that later, by Lewis Thorpe in his Two Lives of Charlemagne: Einhard and Notker the Stammerer (Harmondsworth 1969, many reprints), and the latter edited by Ernst Katz in Georgius Heinricus Pertz (ed. ), Monumenta Germaniae Historica inde ab anno Christi quingentesimo usque ad annum millesimum et quingentesimum: Scriptores tomus I (Hannover 1839), pp. 19-39, and mostly translated by P. D. King in his Charlemagne: translated sources (Lancaster 1987), pp. 137-145. 3. As well as the snippets from the Internet Medieval Sourcebook I’ve linked to above, most of these texts exist in some kind of translation, thus I know of: Katherine Fischer Drew (transl. ), The Laws of the Salian Franks (Philadelphia 1991) and eadem (transl. ), The Lombard Laws (Philadelphia 1996), though I also know that I somewhere read a review of the former by Patrick Wormald (in English Historical Review or Speculum I think, something I could hit by accident on JSTOR anyway) in which he said, roughly, “well, we’ve been needing a decent translation of the Salic Law for a long time and guess what, we still do”. Not a man to mince his words, dear Mr Wormald. There’s also Theodore John Rivers (transl. ), The Laws of the Salian and Ripuarian Franks (New York City 1986), which I guess didn’t meet his exacting taste either. Still plenty more to do though. For the Goths, there’s S. P. Scott (transl. ), The Visigothic Code (New York City 1910, 2nd. edn. 1922), online here. The Latin of all these texts and more is edited in the various volumes of the MGH’s Leges series. On how the Visigothic Law survives in this period, you can see Roger Collins, “‘Sicut lex Gothorum continet‘: law and charters in ninth- and tenth-century León and Catalonia” in English Historical Review Vol. 100 (London 1985), pp. 489-512, & idem, “Visigothic Law and Regional Diversity in Disputes in Early Medieval Spain” in Wendy Davies & Paul Fouracre (eds), The Settlement of Disputes in Early Medieval Europe (Cambridge 1986), pp. 85-104, both of which are reprinted in R. Collins, Law, Culture and Regionalism in Early Medieval Spain, Variorum Collected Studies 356 (Aldershot 1992), V & VI respectively, but now also Jeffrey A. Bowman, Shifting Landmarks: Property, Proof, and Dispute in Catalonia around the Year 1000, Conjunctions of Religion and Power in the Medieval Past (Ithaca 2004), pp. 33-55. 4. Best now approached via Rosamond McKitterick, The Carolingians and the Written word (Cambridge 1989), pp. 23-37, and now Christina Pössel, “Authors and Recipients of Carolingian Capitularies, 779-829” in Richard Corradini, Rob Meens, Pössel & Peter Shaw (edd. ), Texts and Identities in the Early Middle Ages, Forschungen zur Geschichte des Mittelalters 12, Denkschriften der phil.-hist. Klasse 344 (Wien 2008), pp. 253-274. 5. And that definition is: “A document constructed as if for public reference, by which one party affirms the rights of another”, for which if you like you can quote J. Jarrett, “Pathways of Power in late-Carolingian Catalonia”, unpublished Ph.D. thesis (University of London 2005), p. 27. I think it’s the only one that works. 6. Not least of course Wendy Davies, Acts of Giving: Individual, Community, and Church in Tenth-Century Christian Spain (Oxford 2007), which deliberately covers only one sort of document and is really interesting about it. Here is a light-weight diversion while I wrestle with a lecture. By various routes I’ve happened upon some of my old teachers in Cambridge strutting their scholarly stuff on the Internet and thought I’d direct your attention to them. Dr Catherine Hills, famous in certain circles as the person who’s probably excavated more Anglo-Saxon graves than anyone and whose recent book Origins of the English is well worth a look, lectured me in Anglo-Saxon Archaeology during my M. Phil. in Medieval History at Cambridge, and has always been ready with news and help since then when I’ve had the pleasure of running into her. Here she can be seen talking about a dig in her actual college, Newnham, and although it is something of a puff piece about how brilliant a Cambridge education is, nonetheless there she is being herself and unproblematically getting teenage girls to clear a metre and a half depth of soil in order to uncover Roman remains. And then, more purely scholarly, my old boss, patron and fount of information and help, Dr Mark Blackburn, who also taught me during that M. Phil. as well as by knowledge, publication and example for the time I spent at the Fitzwilliam, managed to get onto the BBC to talk about Anglo-Saxon coinage (and an Elizabethan medal), and there aren’t many people who could do so interestingly enough to make that worth recommending. Here Mark demonstrates that he can. Long may he so continue! It’s an article with supporting audio, so I can’t embed it here, but do go look and listen. Instead, I can offer brief reports on a couple of truly macro-scale papers that I heard in Oxford in the early part of the year, and first of these was the inestimable Dr Mark Whittow, who at rather short notice had to draft himself in to address the Oxford Medieval History Seminar on 17th January, and did so with the title, “Pirenne, Mohammed and Bohemond: before Orientalism”. You will immediately observe that this is a title implying a fairly broad sweep of knowledge and a deliberately provoking argument, and so it was. I can’t do it justice, so I’ll do it the hopefully venal injustice of a short summary. Mark asserted that in some fundamental ways the famous Pirenne thesis, originated by the gent on the stamp above and arguing that the ancient world’s economic arrangement persisted long after Rome’s fall and was only really broken up by the Muslim conquests that separated Africa from the Christian territories on the north of the Mediterranean, has now more or less been proven by archæological finds (such as the occupation at the Crypta Balbi in Rome and Pella in Jordan, which stopped receiving imports from across the Mediterranean only in the eighth century), as well as a cursory reading of the letters of the trans-Mediterranean traveller Pope Gregory the Great.1 Whether or not the territories of the West belonged to it in any direct sense, they all belonged to the political context and mental world of the Empire still. This is of course a powerfully explanatory thesis, and I’m certainly not equipped to critique it all, nor, given how massively helpful Mark has been to me since I arrived, do I really feel like doing so. At the time, this seemed almost insuperably convincing and questions mainly centred on whether Pirenne’s picture could be called right given what we know of the alternative networks developing, in the North Sea and through the Caucasus and Baltic regions, which drain focus from the Mediterranean economy anyway. Chris Wickham also pointed out a long tradition of dismissing the East which predates the First Crusade, visible for example in Western responses to Iconoclasm, which Mark suggested came from the Roman tradition of sneering at the Greeks. It does seem to me, however, that to stand up fully the broader thesis requires that we accept arguments from silence about networks and connections in the West, which someone like Martin Carver might question,4 while at the same time dismissing such arguments in the central Mediterranean in the light of recent finds. New finds might obviously also mess with the picture in the West. Likewise, the quantity of evidence feels important. The ending of Roman grain shipments from Africa to Rome, and then to Constantinople, must have reduced the weight of trade across those routes.5 If the contacts were already attenuating before the Muslim advent, and it was the Muslim conquests that finally caused them to drop off completely, the effects that Mark was arguing for would have been under way before the Muslim conquests and Pirenne’s thesis would be right, perhaps, but lose much of its explanatory value. Michael Bentley did also ask if there was any evidence that would actually disprove a theory so based in a subjective reading of patchy manuscript preservation. This, in as much as it amounted to demanding the proof of a negative, seemed a bit unfair, but the question of falsifiability does still lurk. We may never be able to prove Mark wrong if he decides to run with this, but it will also be very hard to be sure that he’s right. History is fun like that, isn’t it? 1. Some quick web-digging finds the Crypta Balbi excavations reported in Daniele Manacorda, Crypta Balbi. Archeologia e storia di un paesaggio urbano (Rome 2001) and Gregory’s letters are now all translated in John R. C. Martyn (transl. ), The Letters of Gregory the Great (Toronto 2004). I don’t have a reference for Pella. 2. The obvious one is Adomnán of Iona’s De locis sanctis, ed. & transl. Denis Meehan as Adamnan’s De locis sanctis (Dublin 1958) though you could if you liked find an older translation online here. 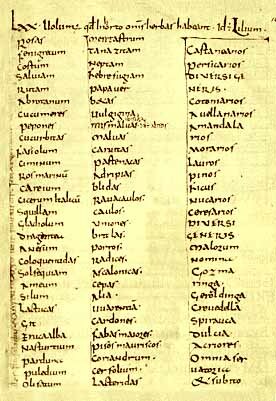 Bede like Admonán’s work so much he wrote his own, and you can find that translated online here, transl. A. van der Nat as “Regarding the Holy Places, by the Venerable Bede”, from the edition of Paul Geyer of it as “Bædae Liber de locis sanctis” in idem (ed. ), Itinera Hierosolymitana, sæculi IIII-VIII, Corpus scriptorum ecclesiae latinorum XXXVIIII (Vienna 1898). 3. On which a quick study might be Jonathan Phillips, “The Latin East, 1098-1291” in Jonathan Riley-Smith (ed. ), The Oxford Illustrated History of the Crusades (Oxford 1995), pp. 112-140. 4. A suspicion I have mainly on the scale of connections I’ve heard him attribute to monastic centres in Pictland, as for example in his “Conversion and Politics on the Eastern Seaboard of Britain: some archaeological indications” in Barbara Crawford (ed. ), Conversion and Christianity in the North Sea World, St Andrews House Papers 8 (St Andrews 1998), pp. 11-40, but shared by a number of the contributors to Sally Foster (ed. ), The St Andrews Sarcophagus: a Pictish masterpiece and its international connections (Dublin 1998). 5. My cite of resort for this remains Chris Wickham, “Marx, Sherlock Holmes, and Late Roman Commerce” in Journal of Roman Studies Vol. 78 (London 1988), pp. 182-193, rev. in idem, Land and Power: studies in Italian and European social history, 400-1200 (London 1994), pp. 77-98, and of course that does mean I’m twenty years out of date and new evidence may very well have changed the picture. I know what the answer to this is, of course, and it’s now quite close to the top of the to-read pile but as ever other stuff is more immediately urgent. 6. Professor Campbell’s paper was loaded with references, which he displayed by adding them onto the relevant presentation slide as he wound up each point. This was very stylish but left one little time to copy them down. However, I bet most of them are in what seems to be a related publication, B. M. S. Campbell, “Physical Shocks, Biological Hazards, and Human Impacts: The Crisis of the Fourteenth Century Revisited” in Simonetta Cavaciocchi (ed. ), Le interazioni fra economia e ambiente biologico nell’Europe preindustriale, secc. XIII-XVIII. Economic and biological interactions in pre-industrial Europe from the 13th to the 18th centuries. Atti della “Quarantunesima Settimana di Studi” 26-30 aprile 2009 (Firenze 2010), pp. 13-32 and online as PDF here. Meanwhile, the damn handy graph I’ve used as illustration is from Michael E. Mann, Zhihua Zhang, Malcolm K. Hughes, Raymond S. Bradley, Sonya K. Miller, Scott Rutherford & Fenbiao Ni, “Proxy-based reconstructions of hemispheric and global surface temperature variations over the past two millennia” in Proceedings of the National Academy of Sciences Vol. 105 (Washington DC 2008), pp. 13252-13257, doi:10.1073/pnas.0805721105 and otherwise online unpaginated here. 7. Not, of course, that I’m happy about living in the era where this is a sudden and urgent political concern that the reigning world-system is completely unequipped to tackle. I have a son, after all, I’m not really happy about the world I’m bequeathing to him. Name in print V, VI & VII! On the left, in the blue cloth, ladies and gentlemen, the current issue of Archiv für Diplomatik, featuring, I’m very happy to say, an article by myself on a certain archbishop of Catalonia, who most likely wasn’t ever actually an archbishop. Arguing this, which is a variation of the Dirk Gently inversion of Sherlock Holmes’s dictum (i. e., in this case there seems to be unimpeachable evidence, but what it asserts is just so improbable that the evidence must be questioned), however, ultimately means suggesting that maybe about a third to a half of the ninth-to-eleventh-century documents we have issued by the popes may not actually have been officially issued by them. I suppose this might ruffle a few feathers but I don’t think there’s any getting away from it and I’m not the only person saying it. For the others, you should see the paper.1 I have offprints spare. 1st page of Jarrett, "Archbishop Ató"
Then, on the right, in the tasteful grey card covers, a long-delayed issue of Papers of the Medieval Hispanic Research Seminar, published by Queen Mary University of London, collecting the papers of a conference at which I presented that you may remember me blogging about. A variety of misfortunes have beset this publication but it is now out, under the title Early Medieval Spain: a symposium and featuring Jinty Nelson, Wendy Davies, Ralph Penny, Andrew Fear (twice) and, towards the back, me, giving the paper that was all that could be got out of my original idea for my thesis, one of the pieces of writing I’ve done I’m most pleased with describing the little we can see of the local societies on the Catalan frontier before they are incorporated into the wider polity of counties and bishoprics and castle terms and so on.2 It is good fun, includes a lame pun for Anglo-Saxonists, and it’s called “Centurions, Alcalas and Christiani perversi“, what is not to like? I am very pleased to have it out there. No offprints, sorry, but it’s not expensive. First page of Jarrett, "Centurions, Alcalas and Christiani Perversi"
This is not actually exactly the thesis (which of course you can download here anyway). The preliminary whining about charters from the thesis is gone, and though several chapters remain substantially as they were, it adds new work on a couple of places and one particular viscount, sharpens up my treatment of Borrell II, including a deep analysis of a trial of a moneyer for passing false coin; it eliminates a bucketload of embarrassing mistakes (though I’m sure more remain), and of course, it is just three years more up to date than the thesis, with consequent added value. I have no more free copies of this: I kept one, one went to my mum and others to those who have helped me for longest or from furthest, especially those who had no institutional reason to do so. I have however, somewhat to my surprise, found myself recommending it to people I think it would actually help with their stuff, so I suppose I think it all has merit. Just as well really! And it is, well, not cheap, but available, as they say, from all good bookshops, so you can judge for yourself if you like! So hurrah! I’m really quite pleased about this. “Archbishop Ató”, first drafted 2003! and presented then and again 2006, but first submitted, March last year. (Yes, I know. But I’m getting better.) Five drafts. Time from first submission to print therefore just under ten months! I could draw a moral but it involves national stereotypes so I won’t. Rulers and Ruled, first drafted in some sense 2005, revised 2006, and then really thoroughly revised 2006-2007. First submission, March 2007. Time to print therefore three years nine months. I figured it was worth holding on because of the imprint, but also it must be said that now it exists my publishers are doing a sterling job promoting it. Lastly “Centurions”, first drafted late 2007 for a conference in Exeter, lightly revised for its reappearance at Queen Mary, submitted March 2008; stolidly withheld from a journal that were hunting it for 2009 publication because of prior promise; eventual time first submission to print, two years nine months. 1. J. Jarrett, “Archbishop Ató of Osona: false metropolitans on the Marca Hispanica” in Archiv für Diplomatik Vol. 56 (München 2010), pp. 1-41. 2. Idem, “Centurions, Alcalas and Christiani perversi: Organisation of Society in the pre-Catalan ‘Terra de Ningú'” in †A. Deyermond & M. Ryan (edd. ), Early Medieval Spain: a symposium, Papers of the Medieval Hispanic Research Seminar 63 (London 2010), pp. 97-127. 3. Jarrett, Rulers and Ruled in Frontier Catalonia, 880-1010: pathways of power, Studies in History (London 2010). If you are like me, or if gods save you this blog is your main source of history information, you will largely think of Professor Robin Fleming as an expert on the Norman Conquest and Domesday Book, and so it will have been with some confusion that you (in the former of our cases there) learnt of her new book, Britain after Rome, which, I am told, decides that no meaningful history of the period following the Roman withdrawal from Britain can be done from the texts, and therefore ignores them completely in favour of seeing what the archæological record alone tells us.1 This is a weird departure for someone whose stock in trade thus far has been making one particular immense text give up its secrets, but the archæologists I’ve heard talking about it are all delighted by the book, so it was with great interest that I made it down to London against the weather on the 15th December to hear her present to the Institute of Historical Research Earlier Middle Ages Seminar, to the title, “Recycling In Britain after Rome’s Fall”. As that example suggests, there was a lot of regional variation in this presentation. That’s what they were doing with old pots in what would be Oxfordshire, break ’em up and make Saxon-looking stuff with the bits, but when the fort of South Cadbury (which was of course Camelot as any fule kno) was reoccupied in the fifth century one of the things this left for us is Roman cinerary urns, being used in domestic contexts. That is, it was important enough to these guys to use fine Roman ceramics, in a world where those were now basically unobtainable, that they would raid cremation cemeteries and take the urns to put food and drink in. (Yes, we’re still on mistreatment of the dead, sorry.) You see, then, why this rings like fantasy and yet I asked her where this, at least, was written and it’s in a book I’ve read, so I guess that I, like everyone else apparently, must have missed the significance.3) Some places obviously had more building stone to reuse than others; a lot of Professor Fleming’s examples of this stuff came from Bath, which is not really surprising. Closer to Kent, they were reusing Roman funerary ceramics as, well, funerary ceramics, going into the ground next to Merovingian finewares and local pottery. And again, you see, I’ve read more Kentish cemetery reports than some, especially this last few months, but I had not noticed this stuff there and I must go back and look again.4 Everywhere was reacting differently to the new shortages in supply and loss of technical skills, argued Professor Fleming, but the general picture is one of rapidly-developing material poverty being met with manifold and baffling ingenuity as each community made its choice between staying some kind of Roman or becoming early medieval. No Saxons necessarily required, you’ll notice, though of course there were ‘barbarian’ soldiers perhaps around who would now have been important in times of trouble, perhaps important enough to be imitated…5 Even if the quantities don’t add up to the kind of picture I seem to have come away from this paper with, that is a powerful paradigm for the so-called adventus, that is, and one which needs really very few immigrants to make it float.6 Once this gets out, we’re not going to be able to ignore it, so it merits attention, and I was glad to have been attending. 1. R. Fleming, Britain after Rome: the fall and rise, 400-1070, History of Britain (Harmondsworth 2010), to which compare for example eadem, Kings and Lords in Conquest England (Cambridge 1991) or Domesday Book and the law. Society and legal custom in early medieval England (Cambridge 1998). 2. Barrow Hills is not yet actually in print, it must be said, but it won’t be long apparently, Oxford Archaeology’s website advertises it as: Richard Chambers & Ellen McAdam, Excavations at Barrow Hills, Radley, Oxfordshire, 1983-5, Volume 2: The Romano British cemetery and Anglo Saxon settlement (Oxford forthcoming). By that time, of course, I guess that they will have been able to take Professor Fleming’s interpretation into account, since she obviously talked to them, so her source may wind up citing her. Is that actually circular? I’m not sure. 3. It being Leslie Alcock, S. J. Stevenson & C. R. Musson, Cadbury Castle, Somerset: The Early Medieval Archaeology (Cardiff 1995), though on inspection I discover that I actually read only Alcock, “Cadbury-Camelot: a fifteen-year perspective” in Proceedings of the British Academy Vol. 68 (London 1982), pp. 354ff, repr. in idem, Economy, Society and Warfare among the Britons and Saxons (Cardiff 1987) pp. 185-213, so I could very easily have not got this level of detail. 4. Though, again, I must recognise that what I’ve read has very largely been the work of Sonia Chadwick Hawkes, who wrote mainly sober catalogues of finds mainly interested in Saxon material that might be diagnostic of date or ethnic affiliations, in what we might call the old tradition, and indeed that was substantially what I was reading for, so maybe I would again have overlooked or she thought unimportant the Roman material reused like this. I’m much readier to blame me than her, though, and there is an incredible amount more publication than just hers as the link above starts to make clear. 5. I am primed to think like this at the moment by finally making it urgent to read Guy Halsall’s excellent Barbarian Migrations and the Roman West, 376-568 (Cambridge 2007), which covers the barbarisation of the Roman military at pp. 101-110 with copious references. 6. Although, again, I’m conscious that there is out there a very similar invasion-free acculturation and fashion-change argument out there about the creation of Muslim al-Andalus in Spain, which has been basically dismissed as the work of a madman, and I can see the scope for a similar reaction to this work too (referring to Ignacio Olagué, Les Arabes n’ont jamais envahi l’Espagne (Paris 1960, 2nd edn. 1973), which dammit used to be online for free but seems no longer to be, and to which see the stinging rejoinder of Pierre Guichard, “Les Arabes ont bien envahi l’Espagne : les structures sociales de l’Espagne musulmane” in Annales : Économies, sociétés, civilisations Vol. 29 (Paris 1974), pp. 1483-1513, which is online for free, here.